Adapted by WhoWhatWhy from Ilse Reijs and Jan-Noud Hutten / Wikimedia (CC BY 2.0) and BBC News / YouTube. 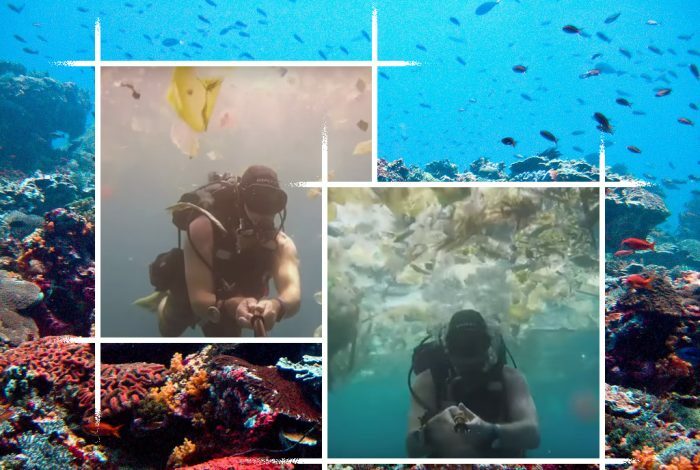 When British diver Rich Horner plunged into the sea at Manta Point, an ocean-cleaning station near the Indonesian resort island of Bali, he was welcomed not by exotic wildlife but by a squirming mass of plastic. In a video shared Tuesday by leading UK papers, Horner documented his submarine sojourn amid a cluster of trash so dense it could have been mistaken for a seaweed colony. Plastic pollution is one of the gravest threats to marine ecosystems, as WhoWhatWhy reported in depth last December. One of the most vulnerable is the coral reef — an essential habitat for wildlife and a critical source of food and revenue for 275 million people. Plastic production is notably prolific in Indonesia, Thailand, Myanmar, and Australia. An astonishing 11 billion plastic objects — including bottles, bags, and rice sacks — were found, covering approximately 30% of the coral reefs in the Asia-Pacific region. According to some estimates the number of objects could reach 15 billion by 2025. Indonesia, the world’s second-largest dumper of plastic after China, pumps 130,000 tons of plastic waste into the ocean every day. Floating debris that snags onto coral reefs leaves them vulnerable to disease. The risk of disease outbreak soars twentyfold when reefs become entangled in plastic, according to a study published Thursday in the journal Science. Last month, thousands of people descended on Bali’s beaches to participate in a mass clean-up, gathering detritus from the coast, rivers, and jungles, while raising awareness about the dire consequences of plastic pollution. The effort was organized by One Island One Voice, a coalition of environmental groups and activists seeking to halt the further disintegration of what many now consider a lost paradise. With an economy buoyed by rapid hotel development and mass tourism, Bali generates roughly 5,000 cubic meters of trash per day. In recent years, though, tourists have become increasingly repelled by the rise in waste mounds on beaches. Perhaps sensing the adverse effect of plastic on the tourism money mill, Asian countries have pledged to address the problem. Thailand, which was responsible for 2.83 million tons of sea pollution in 2016, has established a 20-year strategy to keep waste out of water, including the development of eco-packaging design and eco-friendly substitutes for plastics. Indonesia is launching a mass-education program for school children. And the Philippines announced that it is developing new laws to ban illegal dumping of plastic trash. Taiwan has also put a ban on plastic straws, bags, and utensils into motion, with a total ban due by 2030. Watch Horner’s discovery in the video below. Related front page panorama photo credit: Adapted by WhoWhatWhy from coral reef (Kevin Lafferty / WERC / USGS).